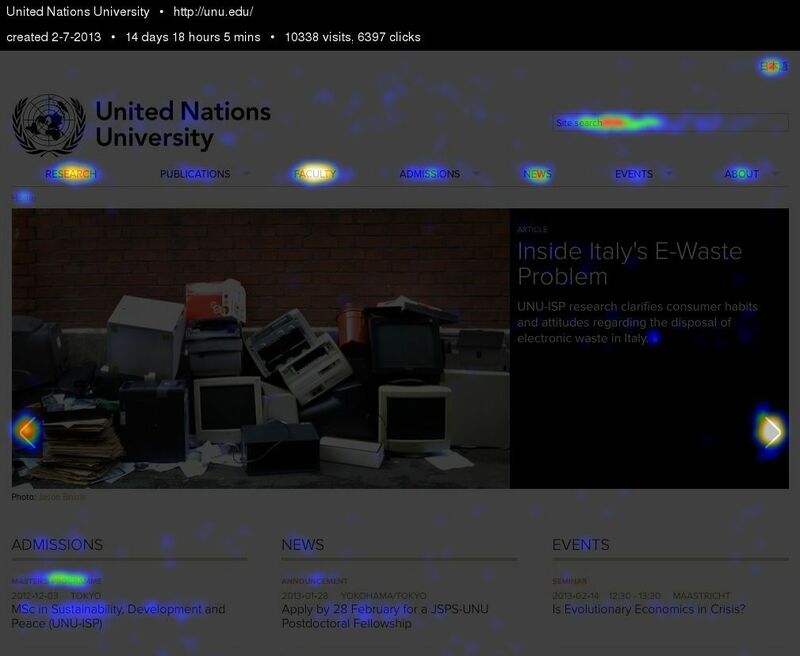 When we built the unu.edu website we built the front page to be as flexible as possible. The page is divided into ten content areas. Four of these are fixed meaning that the type of content displayed cannot change. The six areas on the page have more flexibility. These six areas are the top banner, mini banners half way down the page, the publications list that appears in the bottom middle and the quick links area in the bottom left. 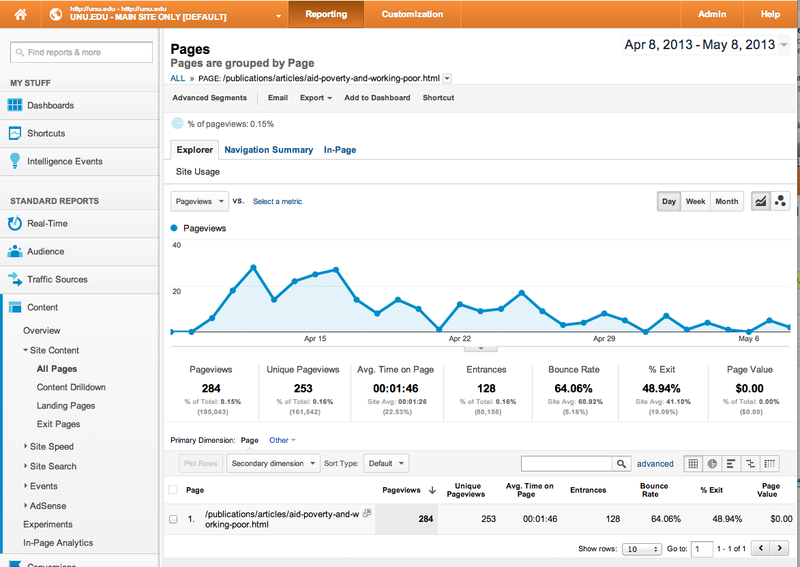 A typical click on a link from the front page will result in analytics data that tells you the click came from the front page. This information is not helpful if you are looking to understand how effective your content areas are and what combination of image and headline works to drive traffic. We wanted to understand which banner and which link actually worked and why. How long the banner was on the front page and how effective it was for how long. 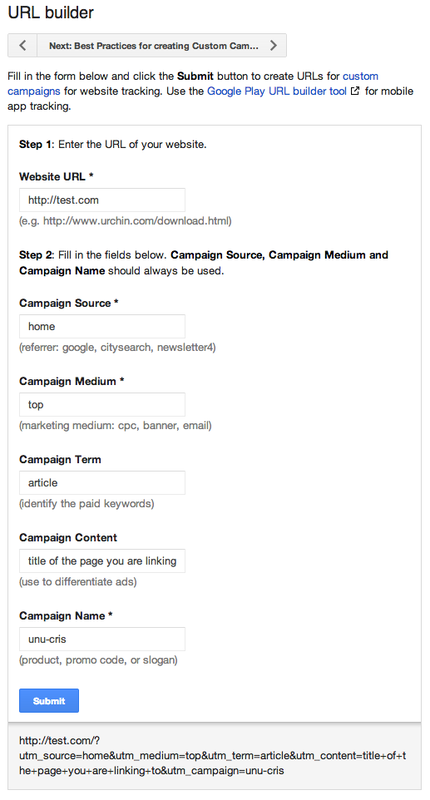 To do this we introduced the use of the Google URL builder. 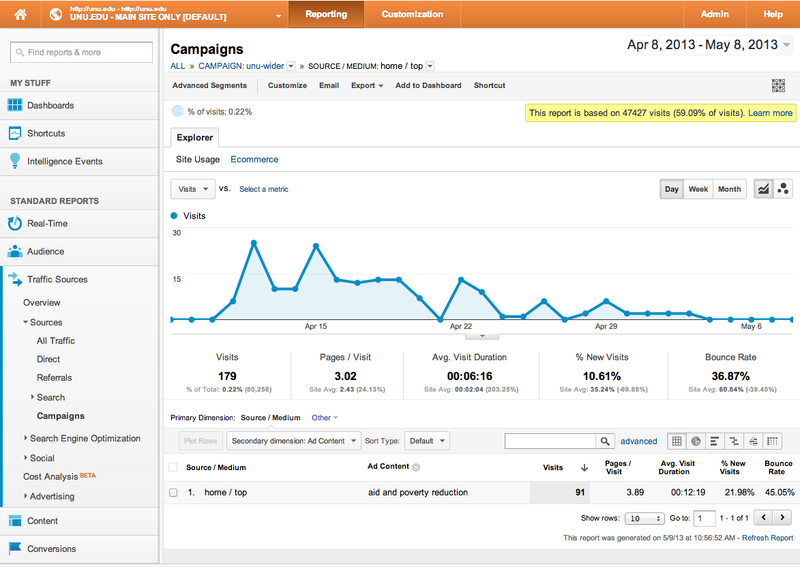 The URL builder works in concert with Google Analytics to deliver information regarding specific items that are clicked. For the unu.edu website we have created a naming convention to be able to reference specific banners, what we are promoting and which institute it is for. The screen shot below illustrates how the form is used. The resulting data in the Google Analytics example below gives us a real insight into how people who visit the site and click on a banner promoting a story differ from the overall group of people visiting the story by any other means (i.e. coming via google, external link or navigating through the website). When you compare the chart above with the one below you can see the average time spent by people coming from the banner is clearly higher than the total visits. Although it is not certain you can assume that almost all visitors coming from the banner read the entire article. The final interesting aspect of tracking performance of the promotional tools we have is when you adjust how they are used. Since we launched unu.edu we had been putting three or more large banners on the site at one time. Using Crazy Egg we learned the most popular item on the whole front page was the right arrow that, when clicked, moves the banner forward to the next promoted story. 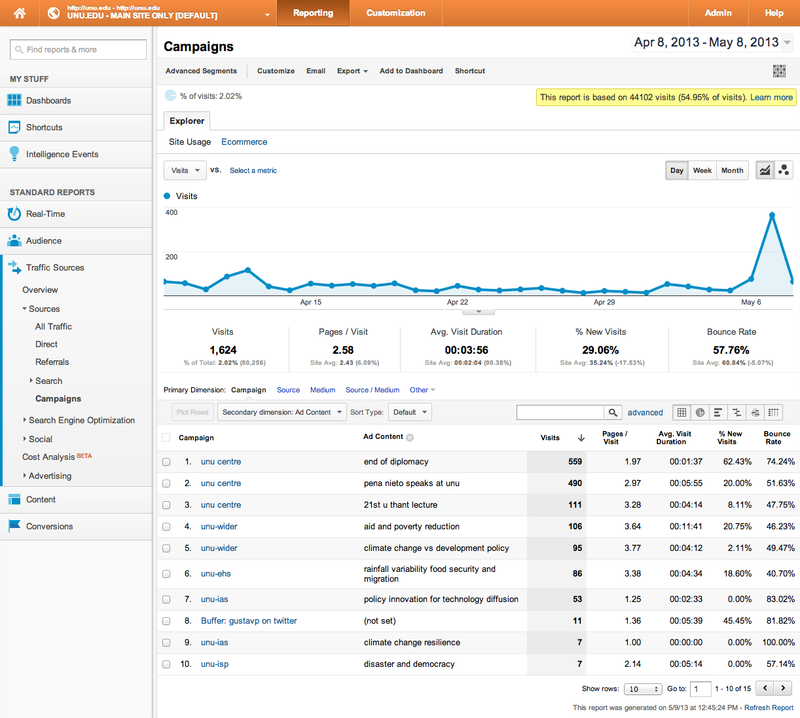 The moment we removed all other banners and had a single banner on the top of the page we found the traffic to the single promoted story went up significantly as you can see in the stats below. The numbers at the top are much higher than the ones below signalling a change from multiple banners to a single banner. 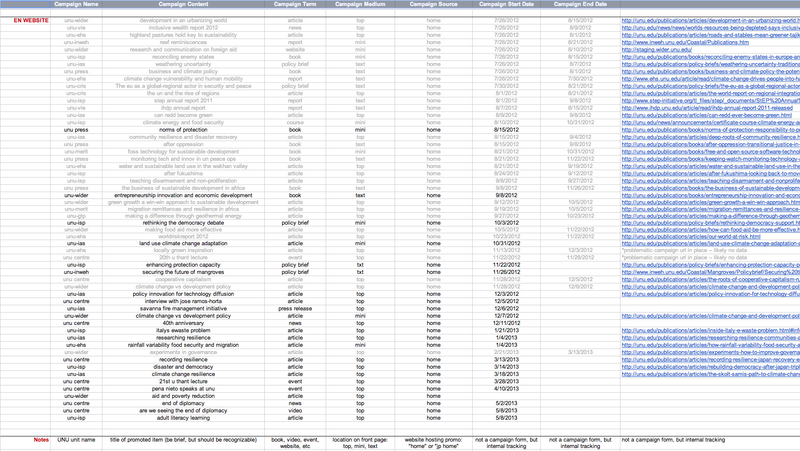 For all (ok – most) of the banners we publish on the website we track using a Google Doc’s spreadsheet. This is shared so that more than one person has access and can add relevant content when needed. Doing this also helps us understand how long the banner was published so we can better understand the analytics data (i.e. how long the banner was online verses how the interest in the story dissipated over time).